My first day of UDS this time started off with remarkably little jet lag. I’m pretty sure I didn’t adjust to California time so I’m still on UTC (Ghana) time, that’s fine for here! There was lots of fruit on my plate at breakfast, and then it was off to registration and then the opening and keynote. Jono isn’t able to attend UDS this cycle because he and his wife are expecting a child any day now, so he recorded a video and that’s what we got to watch as a very standard introduction to how UDS works. Including a reminder to eat your vegetables. In this keynote Mark started off by discussing a subject that seems to be a theme this UDS: real convergence of Ubuntu on TV, tablets, desktops, phones, supercomputers and more. There is currently a working build of Ubuntu for the Nexus 7 and they’re working toward a really polished version of 13.04 that works on it, and not specific tablet edition. He also discussed the choice of the Nexus 7 specifically it’s highly available, inexpensive, they wanted to start somewhere with a single device. Then he did a demonstration of Ubuntu for Android. He also talked about how he was happy to see Valve develop Steam for Linux, and that more gaming companies are following. There is a lot of work going into Ubuntu being preinstalled with partnered OEMs, in China HP Pavilions started shipping an option of Ubuntu preinstalled. There was then a review of some of the cloud accomplishments in the past cycle, including improvements to the juju and MAAS products and the hurdles and out of the ordinary collaboration that had to be done to get Ubuntu running on Microsoft’s Azure cloud. Finally, there was discussion of Ubuntu on ARM, Linaro Connect is co-hosted with UDS, this cycle will show continuation of progress but also expansion of work with other low-power chipsets. This session was held because the plan is for changes to the Ubuntu release cycle to try and avoid having solid freeze moments to increase development velocity, but freezes may still be useful for flavors. The long term plan is for allowing flavors the ability to manage their own releases so that flavors have the ability to release on their own schedule and provide tools so flavors can do push-button creation of ISOs. This will need to be done in multiple steps, so they discussed engineering changes to both front and back ends. Work will also need to be done to determine what needs to be frozen for flavors if they want to ship alpha/betas, and how feasible this all will be while maintaining velocity of non-frozen Ubuntu. This session began with a look through some of the older videos made about development and people discussed some of the issues with the older videos. The one comment that stood out the most is that they should be shorter, and if they were directed at specific answers or small topics they’d be much easier to watch. In this session they reviewed some of the changes made in the Quantal release cycle and what worked, and what needs more work. One of the things brought up of interest to me was how the ISO tracker displays images so testers know whether they should be tested or not, example: alternate images were kept for some time after it was largely decided we shouldn’t bother testing those images because they won’t be included in the release. Also discussed how collaborative editing and general handling of product release notes worked, and moved into the topic of blueprints not being managed well (not completed, etc). Then talked about the queue accepts process and generally agreed that to avoid duplication people should be more vocal on IRC when they’re reviewing something. In a Design and Community talk, Ivo Weevers really focused on how the various form factors (TV, Desktop, Tablet, Phone) impacts design and UI. 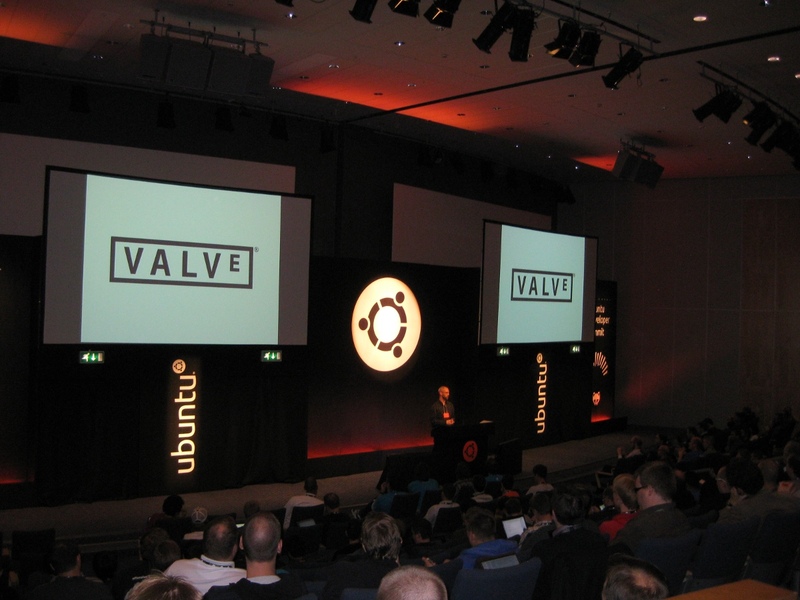 Drew Bliss of Valve was next up, he introduced what Steam gaming platform is and the community that has been built up around it. Steam currently does run on Ubuntu and it’s an ongoing process to test and improve the experience and their release games on it. 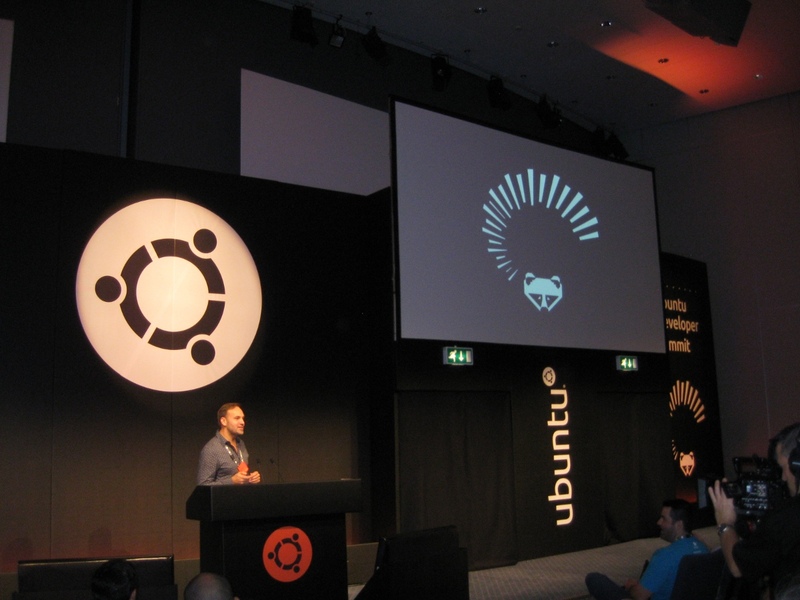 He explained the reason for selecting Ubuntu as the first distribution to target as it has a large, active user base and a company they can collaborate with. We were then treated by the fun announcement that UDS attendees will get access to their Beta testers program! Next up was David Planella of the Canonical Community team on Ubuntu and App Developers, beginning by explaining why they are dedicating resources: attracting more developers who create desirable applications makes Ubuntu a more attractive operating system for users. He then explained some of the existing tools: the app developer site, My apps and the app showdown this past summer. Moving forward they wish to streamline the upload process, but retain a way to deliver the users in a secure way and continue to grow the community and the app developer site. Finally Nick Skaggs led a plenary on testing, including autopkgtest running against all developer uploads to -proposed and AutoPilot functional testing for Unity. This was a pretty sparsely attended session, so we discussed the current op application process and how more timely responses to people who apply on launchpad would be good. Also talked some of the ways that users can contribute aside from being ops, including factoid editing and documentation maintaining. In this session the Edubuntu team reviewed previous work items for desktop, tablet and server to re-evaluate and assign for this cycle. Of particular interest to me work item-wise, there was also some discussion about documentation postponed from last cycle. 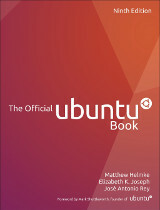 One of the struggles we had in Ghana was lack of teacher-focused documentation for Edubuntu and I was happy to learn that they had thought about reaching out to the Ubuntu Manual team to see about doing an Edubuntu edition of the Manual. I hope to work with them on this, particularly if we can integrate some of the materials Nancy and I worked on, I’ve already shared the link with one fellow UDS attendee who is deploying Edubuntu in schools. I wasn’t all that sure what to expect from this meeting since it was a bit impromptu, but it ended up being a very interesting discussion. There were a fair number of representatives from larger companies who were doing massive Ubuntu desktop deployments and working through the woes of finding good calendar replacements and interfacing with Active Directory and other proprietary infrastructure. Of course all the deployments I’ve been a part of where either SMBs at work or small schools, but I wasn’t alone in that boat either! There were also some representatives from Canonical products (including Ubuntu Advantage) attending the session who were engaged and very interested in these deployments. It ended up going so well that there is a second meetup now on the schedule this week. This evening I headed over the nearby mall to pick up a Telia SIM and 1G of data (total for both was about $13) for when we adventure beyond the hotel wifi later this week. I also got a local charger for my 3DS as it’s not happy about the voltage situation here in Europe (wasn’t in Ghana either), $17 for that, not bad since I’ll use it again when I travel here next year. I then spent an hour or so at this evening’s Meet and Greet even to wrap up the first day of UDS. Good first day, looking forward to tomorrow! This entry was posted on Monday, October 29th, 2012 at 3:05 pm and is filed under tech, ubuntu planet, UDS. You can follow any responses to this entry through the RSS 2.0 feed. Both comments and pings are currently closed. The IRC Ops Meeting was re-scheduled according to Alan. I hope to attend that real session when it goes up but we will have another Remote Participant Google Hangout Starting at Midnight PST. This was the rescheduled meeting :) The original was in the first timeslot of the day and conflicted with the Community Roundtable. Hi! Thiss is kind of off topic but I need some guidance from an established blog. I’m not sure where to begin. Do youu ave any points or suggestions?